A booklet of daily devotions based on Holy Trinity Lutheran Church’s stained glass windows written by Pastor Thumhart. and issued at the Dedication of the Windows and other Memorials held on December 4, 1983. We have tried to preserve the original, in form and style, out of respect for the work that was done at that time. Scripture verses cited are from the King James (Authorized) version of the Bible, consistent with the original document. “0 Man of Little Faith,” donated by Daisy Sherman in memory of her husband, Woodrow Wilson Sherman. “Take Heart, It is I,” donated by the Wheeler and Spreat families, in their honor. “Children, Have You Any Fish?” donated by Mr. and Mrs. Jeff Konnor, in memory of their parents. “Have a Boat Ready,” donated by family and friends of Lucy and Joe Graf, in her memory and his honor. “He Who Has Ears to Hear,” donated by Mr. and Mrs. Harold Beilin, in memory of her parents, Auguste and Herman Stockhoff. “Even the Wind and Waves Obey Him,” donated by Mr. and Mrs. Albert Ziegler in memory of their loved ones. “Let Down Your Nets for a Catch,” donated by Mr. and Mrs. George Mower, in memory of his mother. “Follow Me,” donated by Mr. and Mrs. Garrett Christ, in memory of their loved ones. 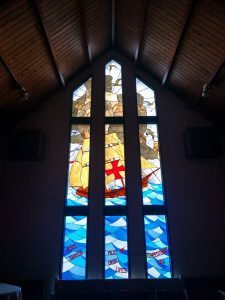 As the resources and needs of Holy Trinity Lutheran Church changed over time, several windows were added to the original eight dedicated in 1983. 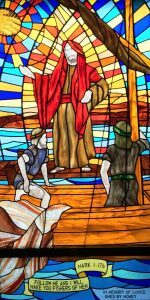 The additions to the sanctu­ary remained in line with the “shore theme” while the single window placed within the columbarium inside Holy Trinity’s front door portrays a loving shepherd with his flock. “Behold, the Lamb of God,” donated in loving memory of Edward R. Hirsekom. “Jesus Savior Pilot Me Over Life’s Tempestuous Sea,” donated by Captain Robert R. Yates and Debora C. Whitcraft-Yates. “Communion Chalice,” (located above one of two exit doors on the church’s south side), donated in memory of Anna M. and Frederick J. Junkerman by Fred and Margaret R. Junkerman. “Baptismal Shell,” (located above one of two exit doors on the church’s south side), donated in memory of Ann M. and Frederick Rauser by Fred and Margaret R. Junkerman. 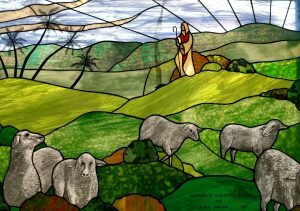 “Shepherd and His Sheep,” (located in the church’s columbarium), donated in memory of Charlotte G. Smullen and Edwin G. Johnson, 1987. “Behold, the Lamb of God” portrays Jesus’ baptism and depicts the beginning of His ministry. “Follow Me” describes Jesus’ calling of Simon, An­drew, James and John to partner in His ministry. “Take Heart”, “Why Did you Doubt”, “Let Down Your Nets”, and “Even the winds and Waves Obey Him”, illustrate his affirmation of the disciples’ human emotions of fear, doubt and discouragement, and speak to their ability to trust in Him for all their needs. “Have a Boat Ready” and “He Who Has Ears to Hear” demonstrates various aspects of His teaching. “Children Have You Any Fish?” tells of Jesus’ third appearance to His disciples after His resurrection. The next day, John saw Jesus coming towards him and said, “Behold, the Lamb of God who takes away the sin of the world.” What does this mean to us? In Old Testament times lambs were offered as sacrifices when a person sinned. By calling Jesus the “Lamb of God,” John meant He would die as a sacrifice to take away our sins. While this window reflects of Jesus’ ultimate sacrifice, it also reminds us of God’s abundant love. Jesus was sent to earth so that, cleansed of our sin, we might live with God for­ever! This passage describes the time when Jesus called four fisherman, Simon and Andrew, James and John, to be among His disciples, saying, “Come ye after me, and I will make you fishers of men.” They were neither famous nor wealthy, but rather were rather ordinary people who would eventually partner with Him in His ministry. 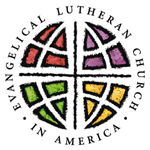 We, too, have been called to partner with Him in His ministry. He has called us to make the choice to follow Him and, by so doing, participate in a fuller life through prayer, worship, fellowship and ministry in our community. The text from which this window was created tells of the time when the disciples, at sea just before dawn and in the midst of a storm, were frightened by what they thought was an apparition walking on water. Not knowing the figure coming towards them was Jesus, they were troubled and cried out in fear. As Jesus came closer, however, he calmed their fears saying, “Take heart, it is I” Have you ever experienced fear during a “fourth watch” (between 3:00 a.m. and 6:00 a.m.) as well? And has Jesus come to you then too, as He had the dis­ciples? One of the first things we must learn as infants is to trust others. Jesus’ walking on water convinced the disciples that He was truly the Son of God and that they could trust their lives in Him. Our “contrary winds” may bring us upsetments and challenges, but these experiences can also lead us to a fuller, more trusting relationship with God. We, too, can count on Jesus coming to us and bringing us strength and comfort, not only during the loneliness of our “fourth watches,” but throughout the entire day! 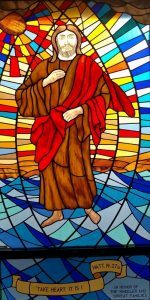 “Take Heart, It is 1,” describes the dialogue that occurred between Peter and James after our Lord had calmed the disci­ples’ fears in the storm announcing it had been He walking to­wards them on water, not a ghost. This window speaks to Jesus’ calling of Simon, James and John as they were fishing in the Sea of Galilee. It describes when Simon, tired from having fished all night, doubted Jesus’ intentions to, “Launch out into the deep and let down your nets for a draught,” only to find his nets so abundant with fish they broke! Like Simon, have you ever doubted there would be “enough” (i.e. money, opportunity, courage), only to pray about your fears and to be blessed by God’s abundant grace? As God responded to Simon, He wishes to bless us with an abundance of joy, peace and love. His response reminds us to accept our limitations, pray in need, and to trust fully in His sovereignty. God has provided, does provide and will continue to provide for our every need! Do you ever encounter doubt? And do you remember times in your life when God’s living responses quelled your fears or refocused your lives, as He did those of James, John and Simon. This text speaks to us all! Have you ever confronted a situation with similar awe and fright? 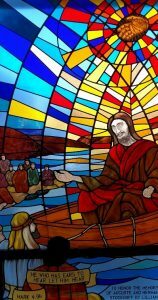 Likewise, have you ever prayed, “Lord, do you not care what is happening here?” This window witnesses to us that there is no storm, conflict or burden Jesus is not able to “still” as He did the waters on the Sea of Galilee. We are His children and He can truly bring us peace! In this page Jesus continues to astound others with His divine authority. A great multitude had followed Him from Galilee, Judea, Jerusalem, Idumea and beyond Jordan and had “pressed upon Him” in their zeal to be healed. Jesus spoke to His disciples, instructing them to have a small ship “ready” in the event the multitude should want to throng Him. Undoubtedly, Jesus recognized some may have fol­lowed Him merely because they were “curious” or –thrill-seekers.” Regardless, He knew He needed to be prepared, ready to teach those who were wishing to make a personal commitment to God. Like Jesus, have you ever stepped back, either to reas­sess a situation, seek safety or to discern more carefully what is truly important to God? And as Jesus’ disciples listened to Him and prepared the boat in the event He might need some “breathing room” from the crowd, in what ways do YOU listen for God’s voice to discern what He would want you to do, then act? This text speaks of Jesus extending his influence though his teaching. Again, a “great multitude” had come to hear him, so many in fact that he chose to “enter a ship” and, using the boat as his pulpit, taught from the boat to the crowd standing on land. 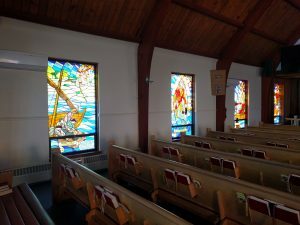 How fitting that Jesus ends his parable with the words, “He who has ears to hear, let him hear.” Placed at the front of the sanctuary, this window calls us to use OUR ears to hear the Word of God through worship. It reminds us as well to strengthen our personal walk with God through the “good ground” provided by prayer and fellowship with other believers. In this way, we too may be as seeds prospering in and through discipleship! This window could very well be entitled, “Breakfast at the Seashore.” It depicts Jesus’ third appearance to His disci­ples after the Resurrection after they had returned from Jerusalem to their boats and nets. The image portrays how after having fished all night without catching a single fish, Jesus appeared to His disciples and learning of their plight, instructed them to, “Cast the net on the right side of the ship and ye shall find.” Though tired and discouraged, the disciples cast their nets Once more and, in contrast to their efforts the entire night be­fore, caught a multitude of fish! Later, as the disciples returned to shore, Jesus invited them to “come and dine,” then shared breakfast. In this humble daily routine, the disciples once again communed with Jesus. How might we, too, commune with our Lord as we engage in the common tasks of daily living? Certainly, we need not wait upon extraordinary events to meet Jesus. Not only is He among us when we worship, He is also among us as we assume even the simplest of routines of every­day living! He wants us to share our days with Him. Take time to feel His presence! 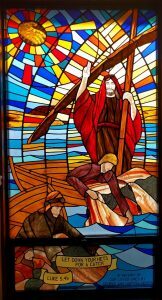 The inspiration for this window comes from a well-loved hymn known as ‘The Sailor’s Hymn.” Written by Ed­ward Hopper, the words for this hymn first appeared in The Sailor’s Magazine (1871) and reflected Hopper’s ministry at the Church of the Sea and Land in New York City, where he met sailors from around the world. Nestled among waves we find the traditional symbol for communion, the chalice. This cup reminds us of the great gift of life Jesus gave us on the cross and helps us remember that the life we’ve received came at the cost of His blood. Jesus said, “Do this in remembrance of me.” (Luke 22:19) Through communion our sense of His nearness returns and we are reminded it is not we who have chosen Him, but rather He who has chosen us! 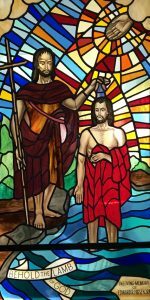 While no one is certain, ancient illustrations depict John the Baptist using a shell to baptize our Lord. The Bible frequently includes the words, “sheep,” “shepherd” and “flock” to describe God’s chosen people. Je­sus clearly refers to this in John 10:14, saying, “I am the good shepherd; I know my own and my own know me, as the Father knows me and I know the Father; and I lay down my life for the sheep.” Be assured, He was intimately aware of how precious the sheep were to His Father! As the shepherd would guide his flock to pasture and water, provide for them, and tend to their wounds, Jesus pro­vides for our every need. If, like sheep, we wander from the flock, place ourselves in dangerous situations, or even graze beyond the Father’s boundaries, our Shepherd is there to lead us back to the fold. And as sheep recognize and attend only to the familiar voice of their shepherd, we, too, can hear His voice stand out among others also beckoning to us…if we listen. As members of Holy Trinity Lutheran Church we are truly blessed to be able to worship amid windows of such striking beauty. Through each we are reminded our Lord loved the shore, enjoyed fellowship, ministered to the same needs and emotions we experience in today’s world (doubt, fear, hunger, frustration, fatigue, to name a few!) and, as seen in His disciples, has chosen everyday people like us to be among his flock. As you enter the columbarium and sanctuary in the fu­ture, may the scenes from the Bible not only draw you to a deeper understanding of the life and ministry of Jesus, but also encourage you to seek always the “hand of God…for He careth for you” (I Peter 5:6,7) in your own lives. Our heav­enly Father has blessed us beyond measure. He desires more than anything else to extend His grace not only through wor­ship, prayer, and study of His Word, but also through fellow­ship we have among one another, not only here at Holy Trinity but also within the community. 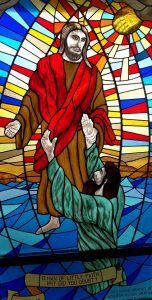 Initially, stained glass windows in the early Church were intended to share visually the story of our Lord. Today, as you gaze upon Holy Trinity’s windows, allow their artistry and history to speak to you as well. Connect with the committee members, donators and craftsmen who made them possible. Most importantly, however, be reminded that their story tells us again and again of the abundant life offered to us through Jesus Christ.